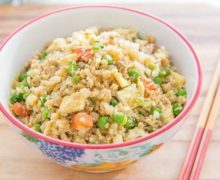 This Cauliflower Chicken Fried Rice takes about 20 minutes to make, and can be served as the main event at dinner. It’s healthy, low carb, and full of both protein and veggies! Of all the healthy food swaps that have caught fire in the past few years, cauliflower rice is one that I can fully get behind. It’s SO good. Trust me, my disposition is to be quite suspicious of all these healthy swaps. Sometimes it seems like the internet wants to make everything out of cauliflower, including rice, pizza crust, and tortillas. But cauliflower rice is so delicious that my 2-year old devours it regularly. That’s the true test. I think the key to enjoying substitutions like these is to accept it for what it is. For example, when I make spaghetti squash, I don’t pretend I’m eating pasta. I just think I’m eating a really uniquely textured squash and enjoy the heck out of it. 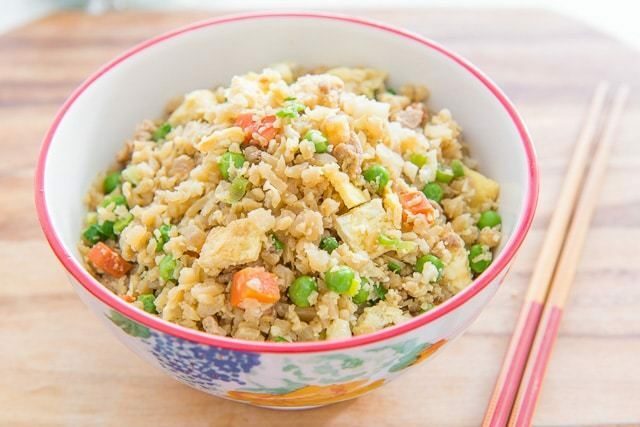 Cauliflower rice has a buttery and slightly sweet flavor to it, and a very pleasant texture. I really think you’ll love it if you try it. 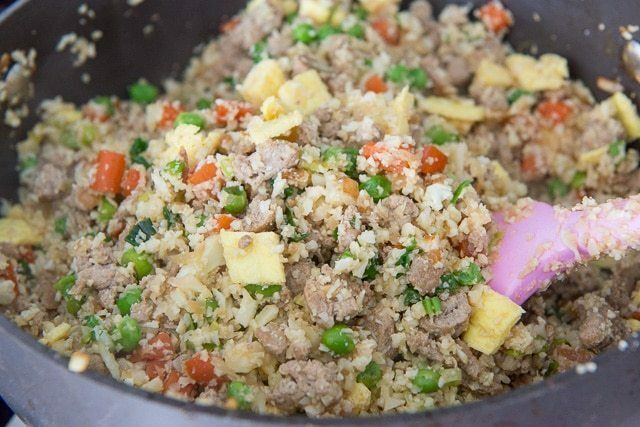 There are many ways to prepare cauliflower rice, but this Cauliflower Fried Rice has got to be the ultimate (though this Cilantro Lime Cauliflower Rice is a close second). 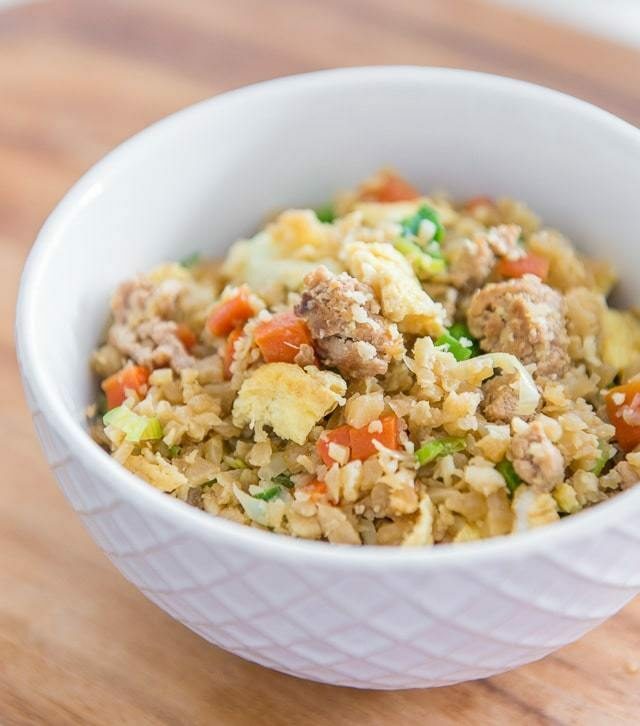 It gets all the same treatment as a regular fried rice, with the classic veggies, soy sauce, and ground chicken. It truly strikes the balance between healthy and delicious. To start, you’ll need to purchase or make some cauliflower rice. 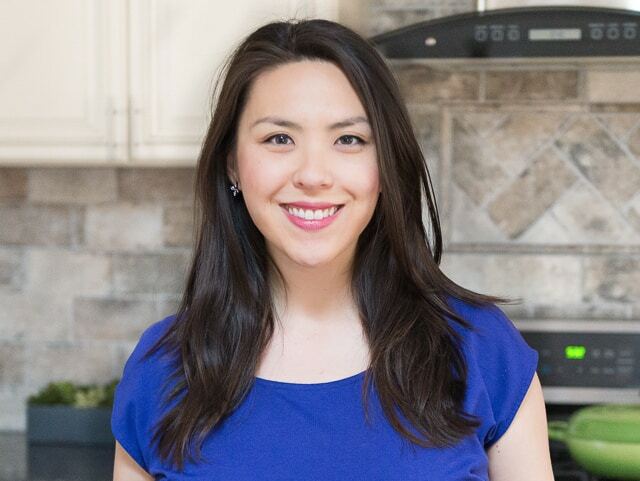 I prefer to make it myself since it’s simple, and both tastes better and has a better texture than store-bought cauliflower rice. 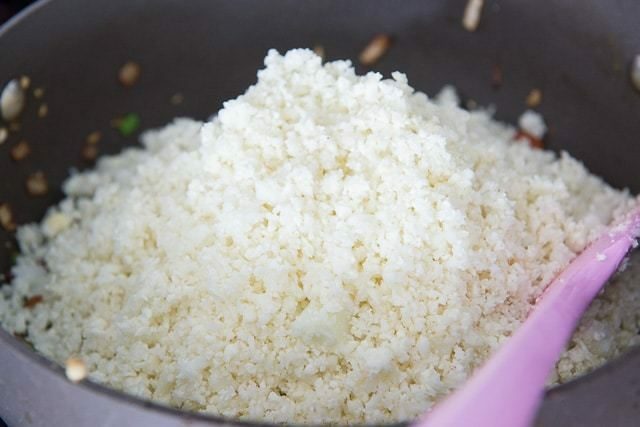 Here is a post I wrote on How to Make Cauliflower Rice. It’s basically just pulsed up cauliflower, with a similar size as a grain of rice. 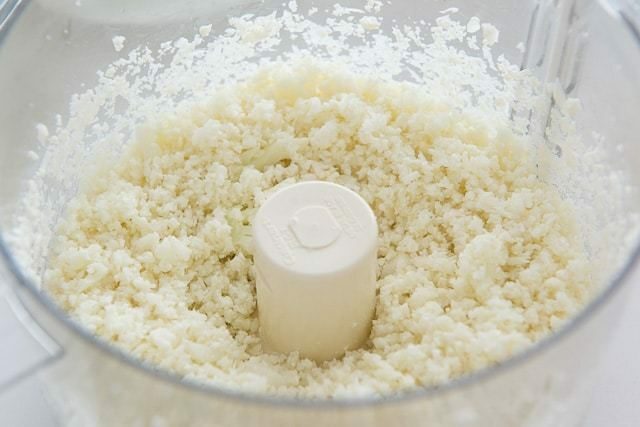 Place cauliflower florets into a food processor and pulse until it’s well-chopped. I actually like the texture a little bit smaller than rice, more of a cross between couscous and rice. Cooking the egg separately is a trick I learned from my mom, and I really prefer it over simply scrambling the eggs into the dish as a whole and spreading tiny bits of egg throughout the food. I find when I have bigger pieces, I get to enjoy the flavor of the egg more in every bite. Now add all the cauliflower rice! I find there’s enough going on here that it can stand alone as the dish for any meal, but you can also serve it with Asian Cucumber Noodle Salad or Asian Broccoli Salad to add more vegetables to the meal. 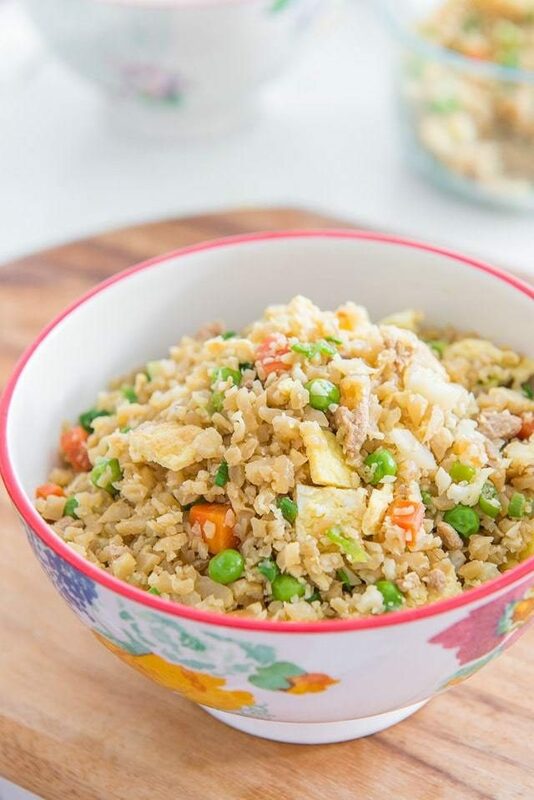 Ready in 20 minutes and easy to make, this Cauliflower Fried Rice with Chicken is healthy, low-carb, full of protein, and full of veggies! 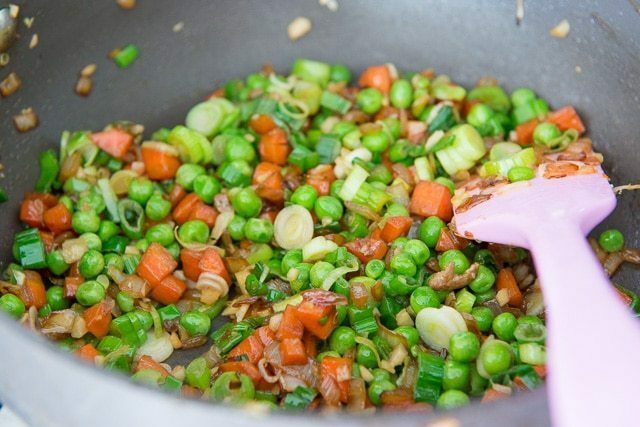 Heat a nonstick skillet or wok over medium high heat, and add 1 tbsp of oil. 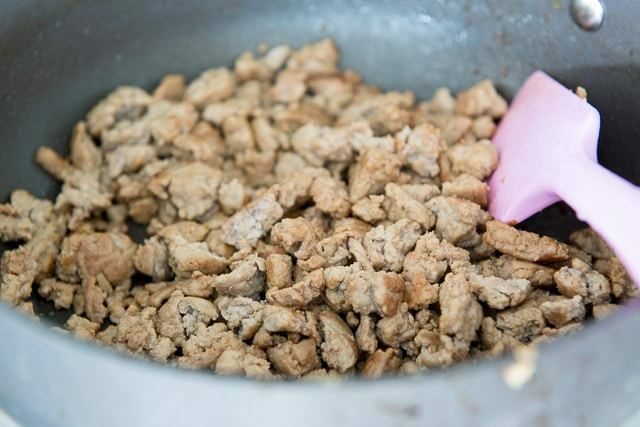 Add the ground chicken, break up the meat into small clumps with a spatula, and cook completely, until no pink remains, about 5 minutes. Add 1 tbsp of soy sauce, stir to distribute, then remove the chicken to a separate bowl. Add 1 tbsp of oil, then add the eggs. Let cook for about 2 minutes, then flip the egg over to finish cooking, about 1 more minute. 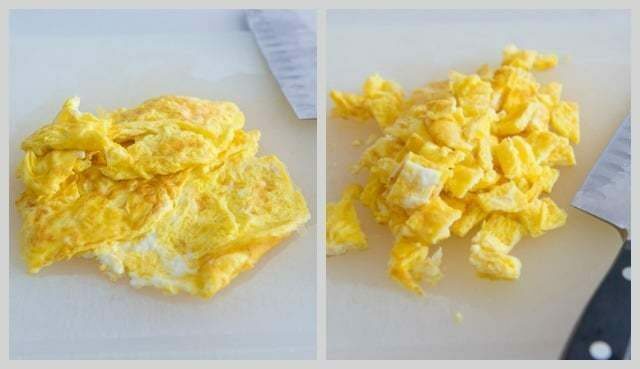 Remove the egg to a cutting board, and chop into small pieces. 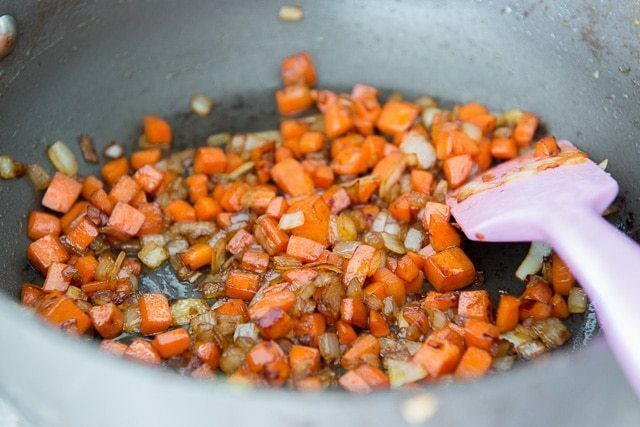 Add the remaining tbsp of oil, then the carrot and yellow onion. Add 1 tbsp soy sauce to season it, then cook for 5 minutes, until slightly softened. 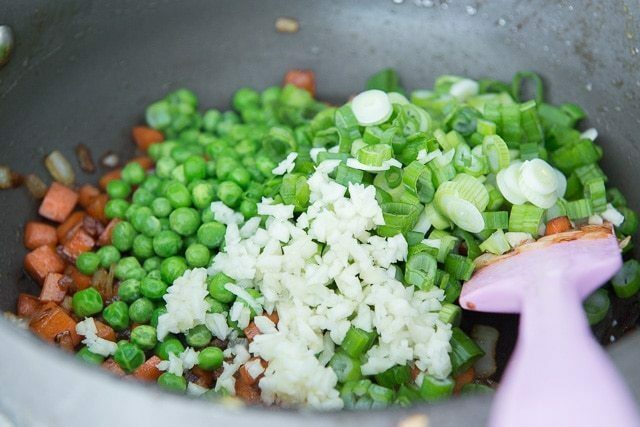 Add the peas, scallions, and garlic, and cook for 2 minutes, until the scallion softens slightly. Add the cauliflower rice, and the remaining 1 tbsp soy sauce. Cook for 3-4 minutes, until the cauliflower is slightly softened, then add the chicken back to the pan, as well as the sesame oil. Stir everything around for 30 seconds, then add the chopped egg back to the pan. Serve and enjoy! 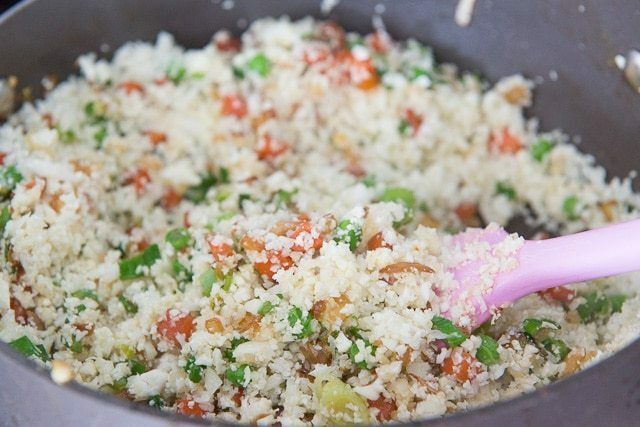 **Here's a post on How to Make Cauliflower Rice, it's very easy. You can also purchase cauliflower rice from stores like Trader Joe’s or Whole Foods, and a 16-ounce bag from Trader Joe’s for instances gives you about 3.5 cups. So good! Super easy and quick! Yum, this sounds really delicious! I’ve started buying the not frozen but already rice cauliflower for this type of recipe, which makes it really easy! Just found that a few weeks ago in my store. This was so much better than I was expecting. Thank you!